Center has a great little movie theater named the Rio. It just has one screen (plus a balcony and stage) and has been in business since 1915, I think. I used to see every movie that came out but had slacked off in recent years. Luckily a cousin moved back to Arcadia, and is a movie buff as well, so we’ve been taking in the latest. High speed sci-fi action seems to be popular this summer. After watching Thor I couldn’t help but think how much I could use that handy hammer on my little hen house repair project. I ordered 30 new baby chicks so I decided it was high-time for some much needed repairs to keep out the neighborhood bobcats. 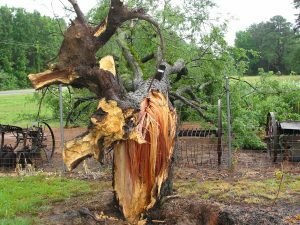 Thanks to my repair mess, my Uncle Noel’s fence and post replacement endeavor, and my veggie garden having been plowed under for the summer, the place has been sort of a mess. 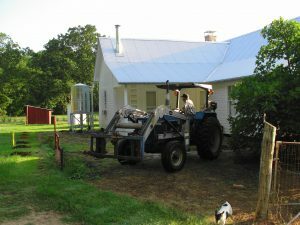 I’m not sure how many of you have read my final chapter in Heirloom Gardening for the South with my mentor Dr. Welch, but if you have you know that my garden here at my Emanis grandparent’s old house has been in a state of flux. I pretty much destroyed the whole thing in order to come up with a new post house-restoration garden. It would be different from all the revolving schizophrenic gardens I’m had in the past because this one would take into consideration my rebellious anti-gardening spine. We’ll just call him “Skelethor.” After shoulder surgery, two neck surgeries, back surgery, and hip surgery, I’m having to think for a change about what I put in and pull out of the ground. You’d laugh if you saw me sitting on two pillows typing this. This is all knew for me. Of course everybody has to go through it eventually. I’m just getting a jump start. Heck, I use to plant lots of stuff and pull it up just for the fun of it. My mom jokes that I plant trees just to chop them down and plant more. No more. What goes in the ground stays in the ground. 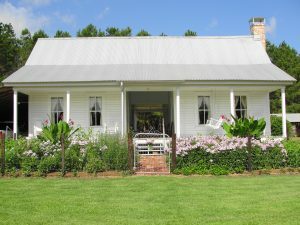 I’ve decided to limit my ornamental gardens to a small 40 x 20 foot rectangular bed in the front of the old dogtrot house here. It’s surrounded by double loop wire and has a 4 foot wide brick walk up to the front steps made from extra bricks from both of my Grannies’ old chimneys. I’ve decided to go with all perennials and to focus mostly on plants that I’ve introduced, plus a few little breeding projects that I can’t seem to give up. I don’t know if any of you have seen the purple border at Sissinghurst in England, but my theme is a little similar but for different reasons. Actually my favorite colors are purple, magenta, maroon, lavender, mauve, lilac, etc. so those come natural. But the underlying theme I have here is anything but yellow. If you yank yellow from the color wheel then orange goes with it because it’s half yellow. Well, darn, come to think of it GREEN should come out too since it’s also half yellow, but that’s a little tough when painting with live plants. But WHY Sir Gregius do you hate yellow so? I really don’t. It just belongs to another mistress. I’ve had a lifelong love affair with golden-yellow jonquils (Narcissus jonquilla) and their kin ever since I laid my eyes (and nose) on them. I’ve planted them by the thousands in my life and plan to do so until I die (at the rate I’m going I better plant faster!). Two of the most uplifting times of the year in Texas are when the oxblood lilies, rain lilies, and spider lilies bloom after a summer drought and when the narcissus, daffodils, and jonquils bloom after a long dreary winter. The color yellow belongs to my sweet jonquils and as King of Arcadia I banish it from the garden each year until the heavenly jonquils return. Although it’s not finished yet, I’m working on a balanced symmetrical planting that reflects the balanced nature of the old house. 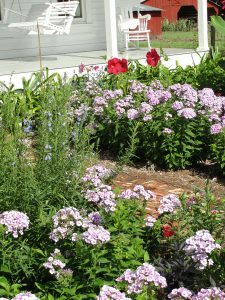 So far I’ve got big sweeps of John Fanick phlox on either side of the walk, echoed by curves of rose mallow hibiscus (‘Jackie Grant’, ‘Peppermint Flare’, ‘Lord Baltimore’, and ‘Red River’), and framed by banks of pink Turk’s cap (‘Pam Puryear’ and ‘Missy Puryear’). In the back corners are several selections I’ve made of the salt marsh mallow (Kosteletzkya virginica). Right in the middle of both sides is the imposing antique French hybrid Canna x iridiflora ‘Ehemanii’. She’s sort of a big buxom cross between a banana and a fuchsia. I’m got a few other things filling temporary gaps including pink bachelor buttons (Gomphrena globosa), Black Pearl ornamental peppers, Henry Duelburg and Rebel Child sages (Salvia farinacea), Stars and Stripes pentas, and Salvia azurea‘Little Boy Blue’. On both side fences I’ve started Pam’s Pink honeysuckle (Lonicera x americana). By next year I will have made the finishing touches and it will fill up nicely I hope. The cannas aren’t very cold hardy so I will remove them after the first frost and replace them with my temporary bluebonnet bottle trees. When the bluebonnets finish blooming, the bottle trees come out and the cannas go back in. It’s a warm season perennial border so I have all winter to cut things back and get it mulched. The doctors keep saying to give up farming and gardening but of course I can’t. I’ll garden with my lips if I have to. We got a four inch rain and storm last month that blew a tree into my sugar cane patch and more onto the fence out back. This of course allowed another cousin’s cows to run free in the yard. This is the main reason for fences in the country. In the veggie garden I picked the last of the tomatoes and plowed all my spring crops under except a row of late planted Burgundy okra which will make all summer. I just planted a row of purple hull peas, a row of Zipper Cream peas, and a row of White Triumph sweet potatoes as they can all take the summer heat. I’ll plant more peas up until July as I get my sweet corn fodder tilled in. Hopefully my small enclosed backyard garden will be finished soon where I’ll grow my special stuff like asparagus, raspberries, and strawberries. I’ll make raised beds with drip irrigation and hope to have it planted by fall. 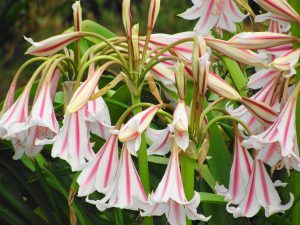 My numerous crinums which looked like August cemetery lilies in Laredo immediately sprang into bloom as did my assorted rain lilies. They are calling for more hundred degree temperatures so get ready. Lucky for me I remember my San Antonio days and how life moved on with or without water. Nobody said gardening was easy. It’s a challenge but then so is life. I garden to live. I just found Greg's Ramblings -- what a breath of fresh air!